Heavy Duty Casters	2" and 3" widths; up to 4,200 lbs. 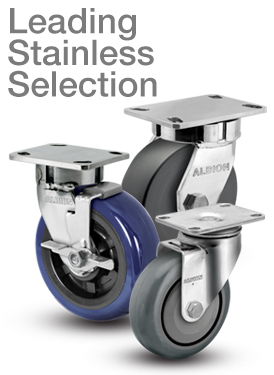 Stainless Steel Casters	Capacities from 200 - 3,000 lbs. 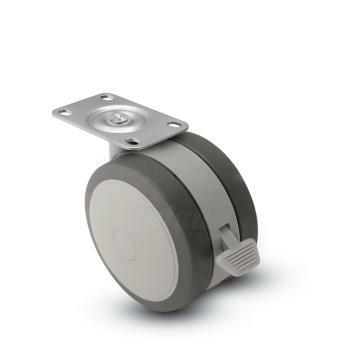 1/2" Diameter Thread	Standard lengths: 1" and 1.5"
3/8" Diameter Thread	Standard lengths: 0.75", 1", and 1.5"
1.25" Wide Wheel Casters	Ideal for carts, tables, fixtures, etc. 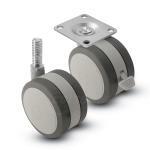 Low Profile Casters	2" diameter wheels, up to 300 lbs. 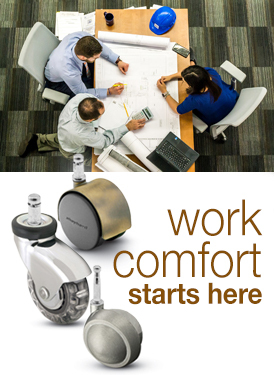 Total Lock Casters	Locks both the swivel and wheel! 1.25" Wide Wheel	Up to 350 lbs. 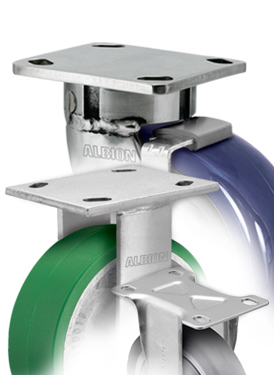 2" Wide Heavy Duty	Up to 1,200 lbs. 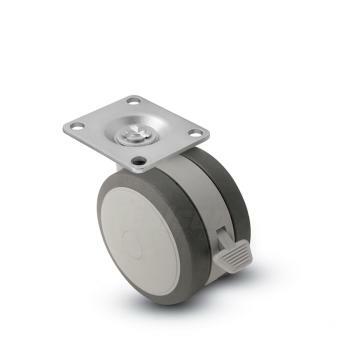 Heavy Duty Stainless Casters	2" and 3" widths; up to 3,000 lbs. Black Pneumatic Casters	Up to 450 lbs. each; 8" and 10" dia. 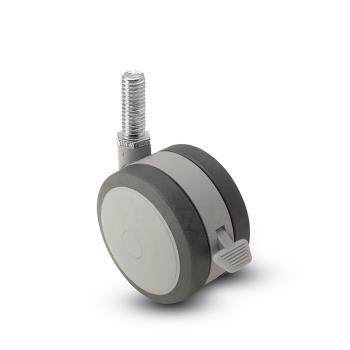 Grey Pneumatic Casters	Up to 210 lbs. each caster, 8" wheel dia. 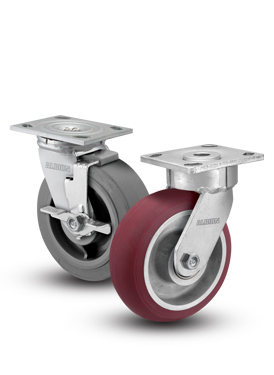 Never-Flat SZ Casters	Never go flat, rejects debris, non-marking! 1.25" Wide Wheel	Up to 300 lbs. Genesis and NG Composite	Sleek & quiet; up to 300 lbs. 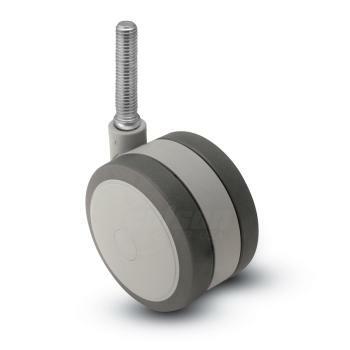 3" Wheel Diameter; up to 1,000 lbs. Mount heights 3-31/32" to 4-1/32"
00 Series Dual Wheel	Dual grey TPR wheels; up to 180 lbs. 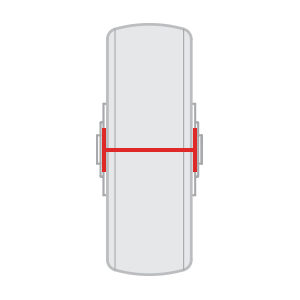 Top Plate Solutions	Up to 1000 lbs. each; 2" and 3" wheel dia. 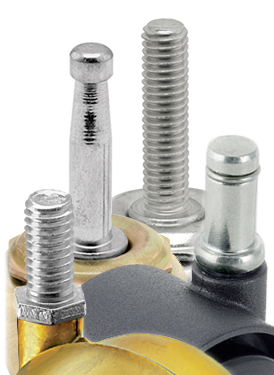 1/2" Diameter Threaded	Up to 300 lbs. 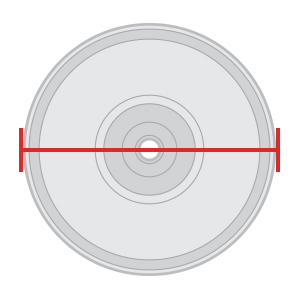 each; 2" wheel dia. 7/8" Diameter Grip Ring	Up to 300 lbs. each; 2" wheel dia. 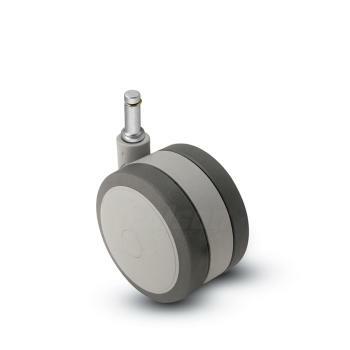 Nylon/Composite Casters	Sleek and quiet; up to 300 lbs. 1" Wide Wheel	Up to 120 lbs. 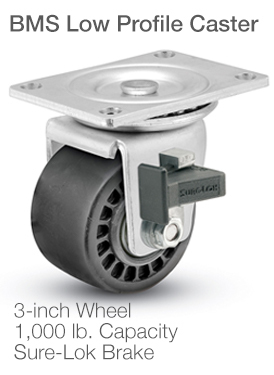 2" Wide Wheel (standard)	Up to 1,200 lbs. 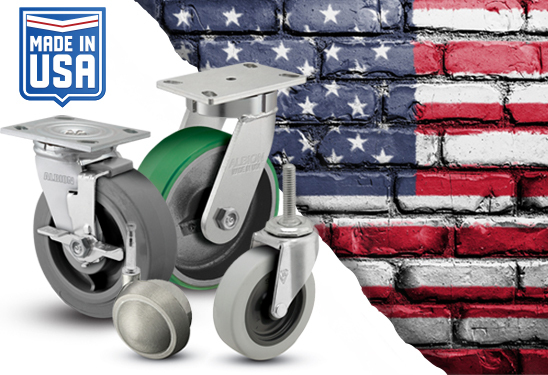 Xtra-Soft Wheel Casters	The best, soft, non-marking wheel. SZ Wheel Casters	Protection like a pneumatic; no flats! 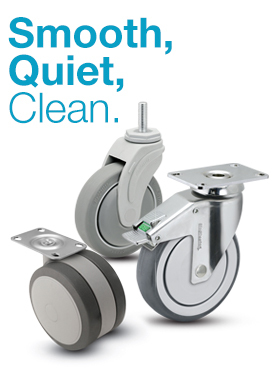 Softech casters provide smooth, quiet mobility with some of highest load ratings available in twin wheel casters. 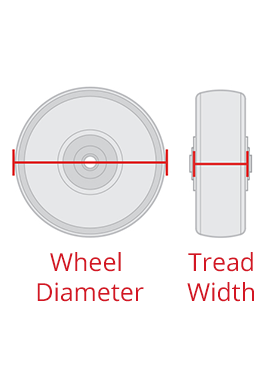 Softech casters feature non-marking, high-tech thermoplastic elastomer treads to provide cushioned rides not commonly found in twin wheel series. 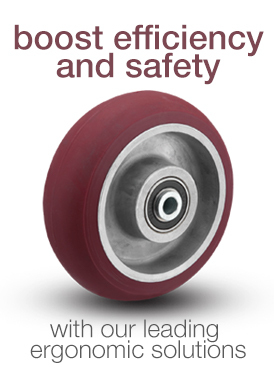 Durable construction with solid riveted axles ensures a positive wheel retention that can handle your heaviest loads.